Always trust a Cuban when it comes to food. 1. Listen up, guys. We need to talk about fritas. 2. “What are fritas?” you might be asking. …In which case I ENVY you for the experience of trying it for the first time. 3. 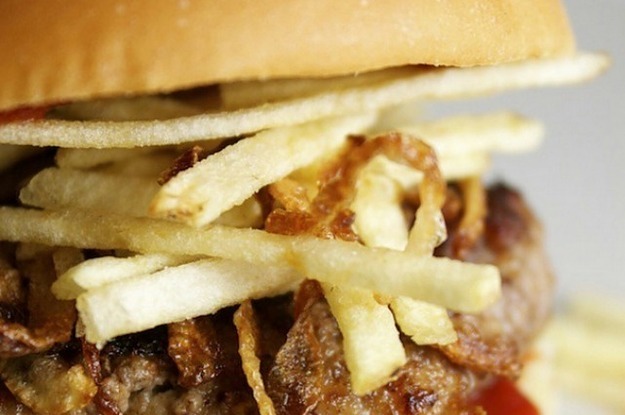 A frita is a Cuban WORK OF ART that’s kind of like a hamburger. In the same way that heaven is kind of like the DMV. 4. They’re typically made with Cuban bread, a ground beef and chorizo patty, chopped white onion, crispy shoestring potatoes, and ketchup (and/or a splash of Tabasco sauce, if you’re so inclined). Basically, take everything that is good in the world, and put it all together. 5. Inferior burgers require lettuce and tomato and nonsense to distract from how BORING they are. Bacon ranch chipotle pizza bagel nacho cheeZzzzzZzZZZZzzzz. 6. As any frita enthusiast will tell you, the most crucial ingredients are the patty and the fries. It’s just so… so beautiful. 7. The patty HAS to include chorizo. It gives the whole thing a savory kick! Keep in mind, there are different types of chorizo! For fritas, go with the cured, Spanish-style variety. 8. And the fries HAVE to be thin and crispy. Chubby fries will throw off the delicate balance of the majestic frita. Trust me on this. 9. This cheeseburger is crying because it knows it’s incomplete without crispy fries and chorizo. 10. ALWAYS go with Cuban bread. It’s the right mix of soft and chewy to soak up all that greasy goodness without becoming a mess. 11. You could add cheese, if you really wanted to. I’ll be real with you, though: It’s better without it. And this is from someone who would legally marry cheese if she could. 12. And you could try it “a caballo” with a fried egg on top, if you’re feeling adventurous. 13. Fritas are pretty abundant in, say, the greater Miami area. 14. …But it’s kind of tough to find them outside of cities with large Cuban populations. 15. You could try making them at home, of course. Here’s one recipe, which incorporates a “not-so-secret sauce”. And here’s another one, which specifically notes that, if it’s not fried, it’s not a frita. 16. Remember to pair your fritas with an ice-cold Materva, Iron Beer, or JupiÃ±a. 17. And finish it all off with a creamy mamey shake. Mamey is a beautiful-looking and great-tasting tropical fruit that tastes like if guava and strawberry had a baby, sort of. 18. So, if you’ve yet to try a frita, go out and hunt one down. 19. And if you’re already a card-carrying fritarian, just make sure to save me some. 20. Go with the best. Go with fritas.